When you think of character development, you probably think of long drawn out scenes full of Aaron Sorkin dialogue and Oscar-worthy acting that goes out of its way to tell who you who a character is or what he or she isn’t. And when you think of action movies, the first thing that usually pops into anyone’s head is mindless popcorn entertainment that doesn’t require brain cells to enjoy. While this may be the case the grand majority of the time, sometimes an action or chase scene can explain who a character is much more efficiently than a character interaction that is dialogue heavy because it’s not using words to tell us who a character is, it’s showing us. Probably the most perfect example of this idea comes from the best James Bond movie ever made: Casino Royale. There are many reasons for why Casino Royale is the best Bond film: The origin story for this new Bond is more personal and complex, the unusual but effective casting of Daniel Craig turned out to be a terrific choice, the exotic locations were robust and beautiful, it featured the best Bond villain to date in the form of Mads Mikkelsen’s subtly villainous Le Chiffre, and it also had the most unique and memorable title sequence set to Chris Cornell’s You Know My Name. But all of these wonderful elements aren’t the first thing that stands out to me when I look back on Casino Royale. 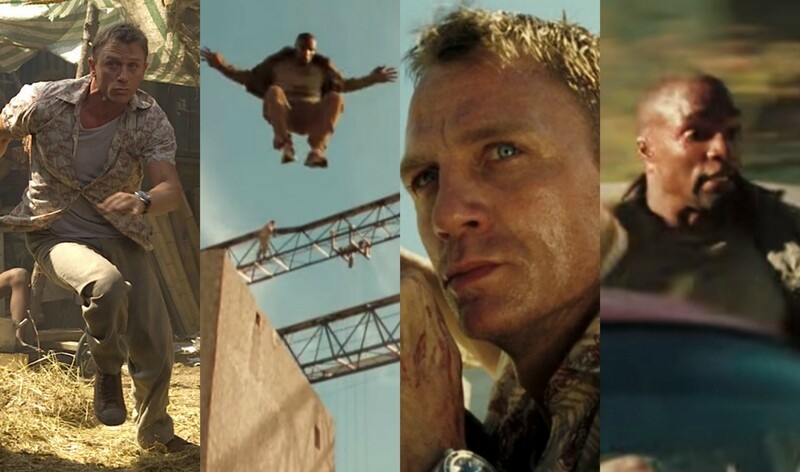 By far, the best thing about Royale is how the filmmakers were able to portray the new Bond, not only through dialogue, but more importantly, through character-driven action. This is showcased perfectly in the first chase scene where Bond chases down a bomb maker, named Mollaka, in Madagascar. This chase scene involves lots and lots of parkour, and while it is not the first film to employ parkour, it was the first time that many people in the general public were introduced to it. What becomes clear as the chase continues is that these two characters see the landscape very differently from one another and execute two totally unique plans to accomplish the same result with varying degrees of success. This makes it so that we see their personality’s bleed into physical things like how they move and interact with the world around them. Mollaka bullfrog leaps over the fence while Bond flips over it. Mollaka climbs up a vertical upright steel beam while Bond runs up a forty-five-degree crane. Mollaka climbs up a steel cable to get to the top of a large crane while Bond kicks the release switch which propels him all the way to the top. Mollaka jumps off the crane and lands on the under-construction building and nimbly rolls, lands on his feet and leaps off again while Bond jumps, rolls and ungracefully topples off the top. 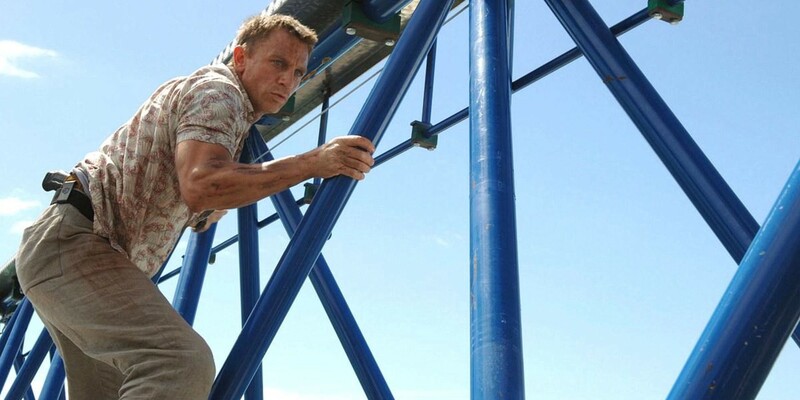 Mollaka takes a path over the top of the building while Bond kicks in a door and runs inside. Mollaka hops down an elevator shaft while Bond slides into a hole in the concrete ground to end up on the same floor. Mollaka jumps up and swings on a pipe to propel himself through a gap above a drywall panel while Bond literally crashes through the drywall like a juggernaut. Mollaka takes a series of leaps towards the ground while Bond jumps onto a scissor lift and cuts the hydraulic line which sends him crashing to the bottom. Mollaka runs on foot to an embassy building while Bond hitches a ride on the back of a van to end up at the same place. Through the course of the chase, one thing becomes abundantly obvious: Bond is the type of person that will stop at nothing to accomplish his mission, even going so far as to storm a foreign embassy singlehanded. It’s interesting how the filmmakers employ subtle and overt differences between the two characters to show how they approach the obstacles in front of them. This gives us an uncanny sense of who these two characters fundamentally are. Not only does the chase sequence look really cool and is super exciting to watch and experience, but this series of action events shows that Bond is not the graceful operator that we all knew, loved and grew up with. This is a new raw Bond that is powerful and almost unstoppable in his ability to finish whatever missions he’s tasked with. He doesn’t always look good doing it, but whatever he does is direct and efficient. While the bomb maker relies on his physical prowess, Bond takes a more thoughtful approach that doesn’t require as much physical energy. 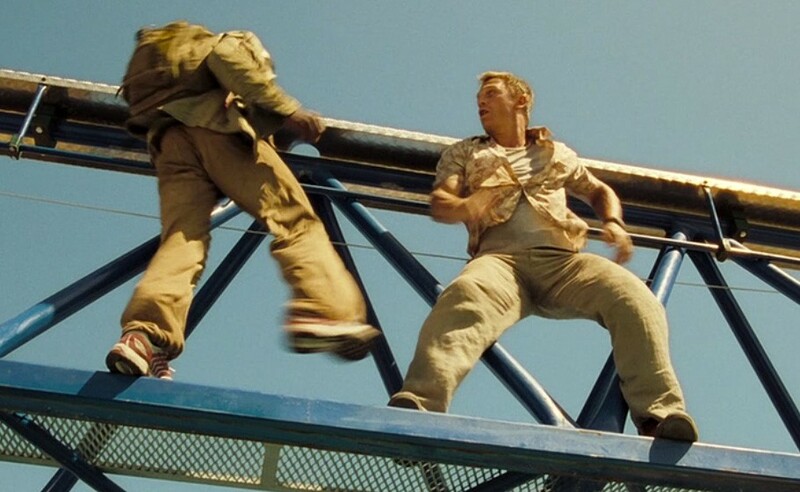 While this could have been just a generic chase scene which people would have been fine with, the infusion of parkour and character-driven action made it become one of the best action moments in cinematic history. Of course not every action scene needs to be this explosive or meticulously diverse in its character portrayals, but what any good scene does need to do is show the individuality of its characters, because if you’re not developing character in an action sequence, then why is it even there in the first place? 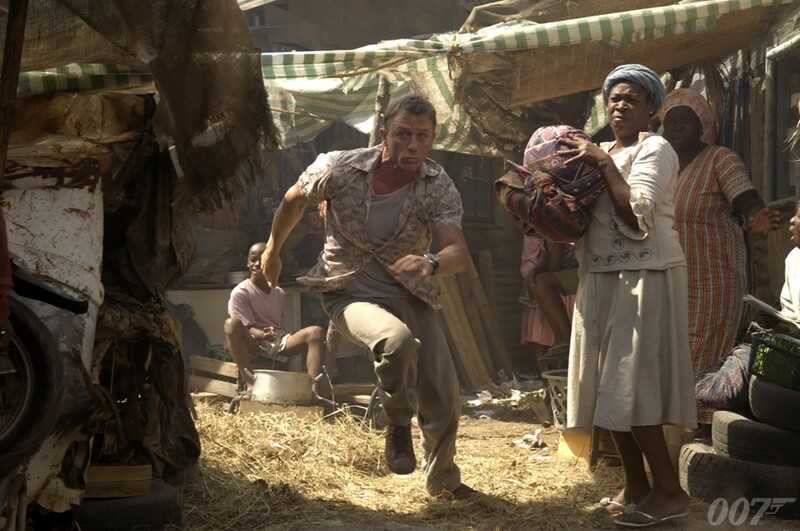 Casino Royale is not the only film to employ this idea of character development through action. One of the better examples of this approach is the fight between Neo and Agent Smith in The Matrix. While Neo was the flashier fighter, Smith was brutal and powerful. Then there’s is the Bourne series that Casino Royale took obvious inspiration from. We constantly see Bourne doing things differently than the other characters, using everyday objects in ways that are borderline weird and unheard of, but always effective. There are hundreds of examples of how to use action to develop characters, but out of all of the great movies to choose from, Casino Royale will always be the best because it turned our notions of who Bond is on its head by developing his character in a new, exciting way. Dialogue is excellent at showing individuality, but sometimes it isn’t the best way to develop a character. As the old adage goes, show, don’t tell. If you enjoy movies and liked this post, click those little clapping hands below and follow me for more stories like this!